Day Four. It's still full-time getting Mom settled. We have been steadily unpacking and finding homes in new places for her lovely things. My friends, Lynne and Suzanne spent an afternoon unpacking a bunch of huge boxes. Suzanne returned yesterday with homemade butternut squash soup and cornbread croutons for lunch. So delicious, that plus her cheerful visit kept me going another 5 hours after. Last night Jane stopped by with a darling welcome gift and hugs for Mom. Every time I think I've hit a wall of exhaustion, someone pops up to remind me that it will all be in place soon. But enough about all that. I've also been thinking about my neglected blog and craft life. For you, dear readers, I am offering this little (and I mean little) inspiration. 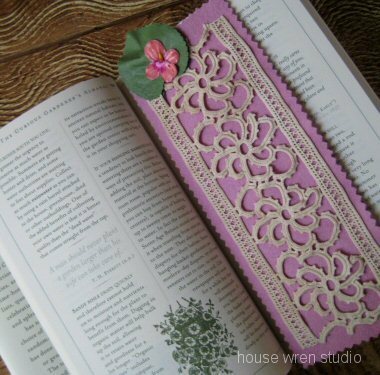 Made from a short length of beautiful tatted lace and a piece of wool felt, this bookmark is easy to make. Cut the lace to size, carefully stitch it onto the larger piece of felt and then pink the edges. I finished the back with a pretty vintage chintz to match and stitched a flower (or a button) to the top on front. Quick, scrappy, and amazingly gratifying as a small project, it makes a sweet thank you gift when tucked into a good book for a friend.